The most competitive challenges to incumbent senators usually occur when a delegate runs. In most of Maryland’s 47 legislative districts, three delegates run at-large and represent the exact same constituency as the senator. As a result, they make excellent challengers. In 2010, then-Del. Karen Montgomery unseated Sen. Rona Kramer in the Democratic primary. Sen. Nancy King and Sen. Jennie Forehand had very close shaves that same year running against either a delegate or former delegate. 4: Sen. Brinkley v. Del. Hough (R). 25: Sen. Currie v. Del. Melony Griffith (D). 26: Sen. Muse v. Del. Turner (D) and two others. 36: Sen. Hershey v. former Del. Sossi (R). 37: Sen. Colburn v. Del. Eckardt (R). 42: Sen. Brochin v. former Del. DeJuliis (D). 44: Sen. Jones-Rodwell v. Del. Nathan-Pulliam (D). The challenging delegates in Districts 4 and 44 don’t necessarily have quite the same natural advantages as usual for sitting delegates because they ended being redistricted into another district and have represented less of their new district than the senator. 43: Sen. Conway v. City Councilman Henry (D). 17: Del. Simmons v. former Del. Kagan (D). 34: Del. James v. former Sen. Helton (D). Today, I preview and rate three senatorial contests among the ten with interesting primaries. District 4 (R): Incumbent David Brinkley faces Del. Michael Hough (R 3), who has been redistricted into this very Republican district in Frederick County. While Brinkley has the home turf advantage, Hough has far more money. This will be a bloody contest with Hough coming at Brinkley from the right and arguing that Republicans need a true conservative to carry the flag. Brinkley has committed the heretical sin of working with the majority Democrats on occasion. More info here and here. Rating: Toss-Up. District 17 (D): Sen. Jennie Forehand is retiring, so this Rockville-Gaithersburg seat in Montgomery is open. Del. 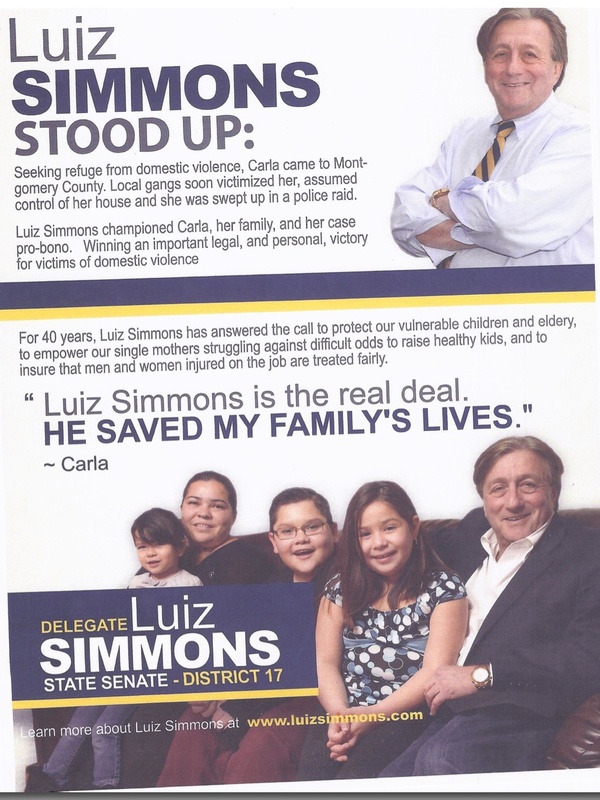 Luiz Simmons, who won this district as a Democrat in 2002 (he previous represented it as a Republican from 1979 to 1983) is going for the open seat. He faces tough competition from former Del. Cheryl Kagan, who represented this district from 1995 through 2003. She challenged Forehand four years ago and nearly won, taking 48% of the primary vote. Kagan will undoubtedly present Simmons as on the wrong or conservative side of too many issues, particularly domestic violence. In the past, Simmons opposed legislation pushed by Sen. Brian Frosh to change Maryland’s standard for obtaining a protective order from a “clear and convincing” standard to the lower “preponderance of the evidence” standard used in every other state (see also WaPo editorial). Interestingly, there is no sign that either Del. Kumar Barve or Del. Jim Gilchrist are rushing to slate with Simmons–a common practice when only one runs for Senate. The question remains if either will take the big step to slate with Kagan instead. Simmons can self-fund, so he’ll outspend Kagan but she at least can fund raise during the session since she’s not in the General Assembly. Kagan has has a base of donors from her previous campaign and possibly can attract new ones who like Forehand but not Simmons. But most importantly, she’ll need to run a good ground game–knock on doors and coordinate volunteers to do the same–to beat Simmons. He campaigns hard and clearly takes nothing for granted since he is sending out mail this early. Rating: Toss-Up. District 42 (D): Incumbent Sen. Jim Brochin faces tough primary and general election contests in a greatly reshaped district. Gov. Martin O’Malley is supporting his challenger, former Del. Connie DeJuliis (more info here). However, Brochin is an indefatigable campaigner and has loads more money than DeJuliis, who served in the 1990s, despite her high level support. Unless Gov. O’Malley goes all in on this one–and he has a very competitive streak–Brochin has the edge. Rating: Likely Brochin.